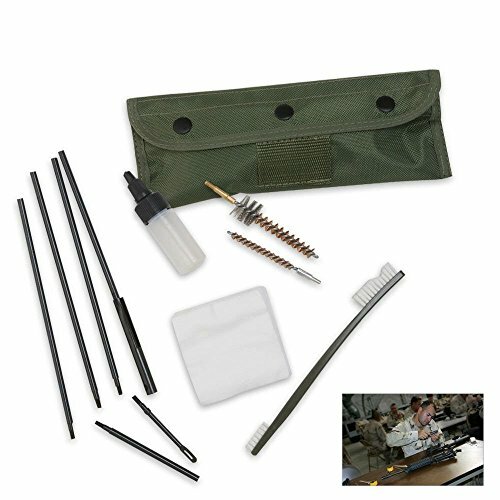 To give your AR-15 the proper treatment it deserves, while maintaining the rifle at peak performance, you’ll need the right AR-15 cleaning kit. Though, in general, kits contain both staple items and individualized accessories that give the ensemble a certain signature flair. A particular item you should be on the lookout for is some sort of brush. Furthermore, a great additional accessory to purchase is a gun-cleaning pick, even though most kits don’t contain them. Without further ado, we present five of the best AR-15 cleaning kits on the market. 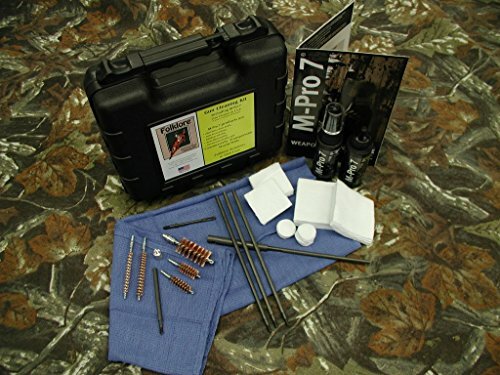 Each of these kits should be able to get your rifle clean over and over again. The Lowdown: A cheap, bare bones, but extremely effective kit, this Militaria model works with all AR-15 and M-16 variants. Militaria markets the kit as being built up to military specific standards, modeled very closely on the actual standard issue kit that soldiers received with their rifles. The kit is designed to be as lightweight as possible, coming with a convenient Velcro holster carrying kit with belt attachments. The kit also contains a bottle for cleaning solvents (not included); a pack of cleaning cloths; two barrel cleaners; a brush; and six variably sized attachment rods. Containing everything you need and nothing you don’t, the Militaria kit is a good option, as it gets the job done with little fanfare and without any bells and whistles. The Lowdown: A step up from the Militaria model in terms of ornamentation and features, the Gun Boss AR-15 cleaning kit boasts a weather-resistant (but not weatherproof) traveling case. In addition to what the Militaria model offers, the Gun Boss offers an extra rod, two extra brush options (a Star Chamber brush and a bolt carrier cleaning brush), and cleaning picks. This variety provides you plenty of cleaning options, and with what you have here you’ll be relatively well prepared for whatever comes your way. That said, although the case is of the highest quality, Real Avid may have sacrificed quality in the name of versatility here, as although the Gun Boss offers many more components than the Militaria kit, they are actually of a lower quality. However, if you truly prize versatility at a good price, the Gun Boss is a solid option. The Lowdown: Skyline Center, Inc. offers a simple, high-quality AR-15 cleaning kit with the capability of cleaning all guns – it’ll work just as well on your AR-15 or M16 as your pistol or shotgun. 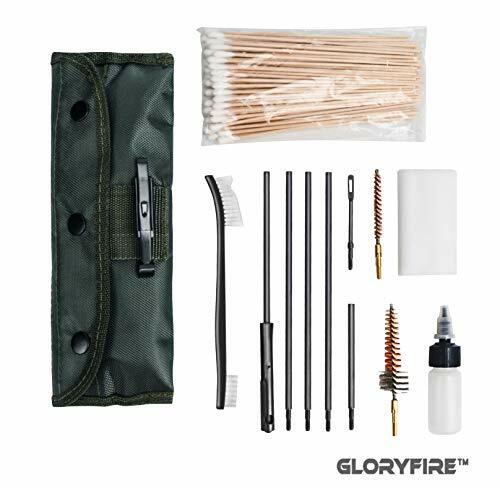 Packaged in a durable, lightweight, easily transportable case, this Universal model offers a small number of tools that you can use in a number of situations, including a military style double ended cleaning brush, cotton flannel patches, a cleaning rod with four pieces, and five additional bore brushes. The whole enchilada weighs less than two pounds, and you’ll be able to take it anywhere without a second thought. 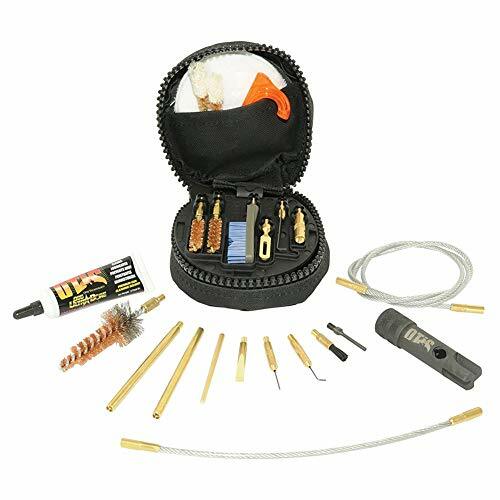 Though in rare cases the cotton patches and brushes can leave something to be desired, overall it’s a well made, reasonably priced, undeniably versatile cleaning kit for all of your firearms. The Lowdown: Returning to kits designed specifically for your AR-15, Real Avid gets it right here with their advanced version of their Gun Boss kit. The Pro Pack is loaded with a number of familiar favorites, including a number of rods, 8 Star Chamber pads, 50 cotton patches, a bore illuminator/safety flag, and multiple brushes. A notable feature of the Pro Pack is its AR 15 scraper, which purports to clean 12 different surfaces on the bolt carrier group. Finally, the cherry on top is the AR-15 field guide, which tells you step-by-step how to take apart your gun, clean it, and put it back together. Overall, it’s tough to find a chink in the Pro Pack’s armor. 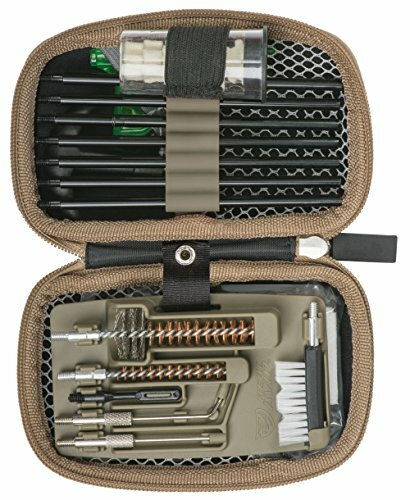 Though it’s a bit pricier than most gun cleaning kits, this particular AR-15 cleaning kit offers extra value with the unique scraper, and the field guide will come in handy more than you think, even for experienced gun cleaners. The Lowdown: Zipping up tight into it’s circular, simplistic black case, the Otis Cleaning System looks more like a collection of CDs than a gun cleaning kit at first glance. However, don’t let appearances fool you – this Otis model is one of the best in the business. Boasting a familiar collection of effective brushes, rods, and the like, the Otis model’s unique feature is its B.O.N.E. tool, which takes care of the bolt carrier assembly. It’s also important to note how small the Otis Cleaning System packs up – it can fit in the palm of a large man with everything all zipped up inside. Though this, along with the price tag, can be off-putting to some consumers, don’t pass on the Otis Cleaning System without a hard look. You won’t find the B.O.N.E. tool anywhere else, and the Otis provides you with everything you could possibly need to take proper care of your firearm. Investing in even the highest end AR-15 cleaning kit won’t cost you a fortune, but it’s worth invoking a maxim to help you make your decision. Several kits offer items you can’t get individually (like the B.O.N.E. tool). Overall, buying a kit is worth the money, and will save you the money of trying to hunt down all the parts you need from a variety of stores.